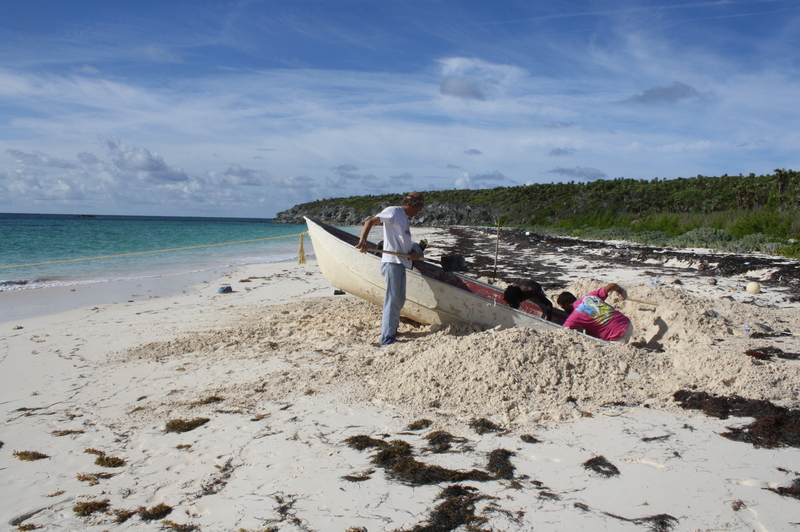 Boat rescue on this little Island of San Salvador in the Bahamas. 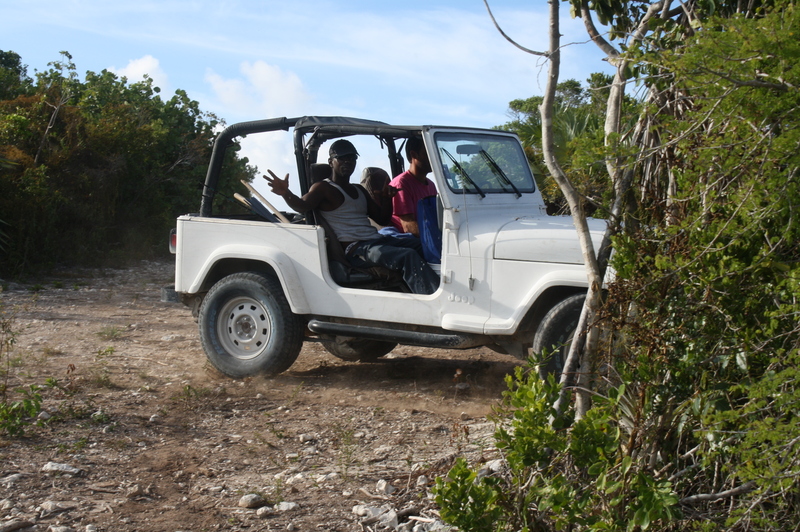 Never a dull moment on this little Island of San Salvador in the Bahamas. You wonder what I do all day? Well here is a story from last week. For years, Tommy had a little aluminum fishing boat about 16 feet with a 9 horse power motor. When he wasn’t using it, he kept the motor in the garage and the boat in Pigeon creek, the east side of the San Salvador coast line. One day he was all excited to go fishing with a friend, packed up his motor and fishing gear and went to Pigeon creek, only to find out that his boat was gone !!! Well other than cigarettes and booze people do not really steal anything on San Salvador. 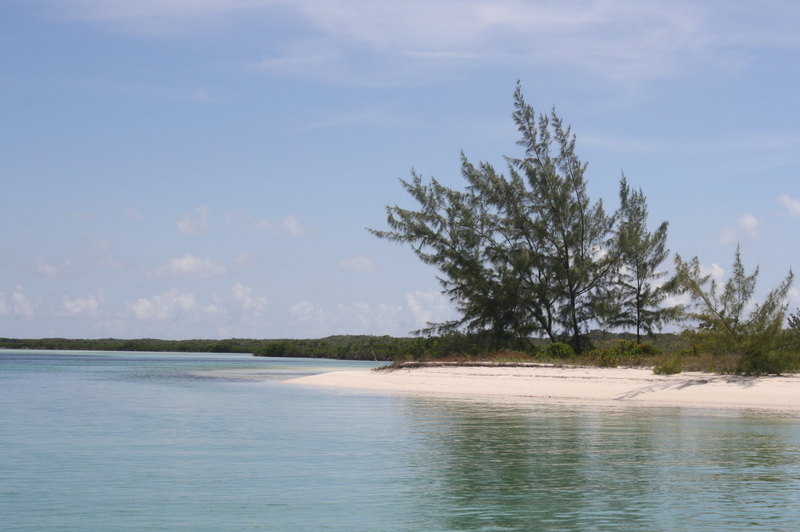 Keep in mind, it is a little island in the Bahamas and everybody knows each other and stealing and keeping it a secret is impossible. Especially something as big as a boat. BUT where is the boat ??? 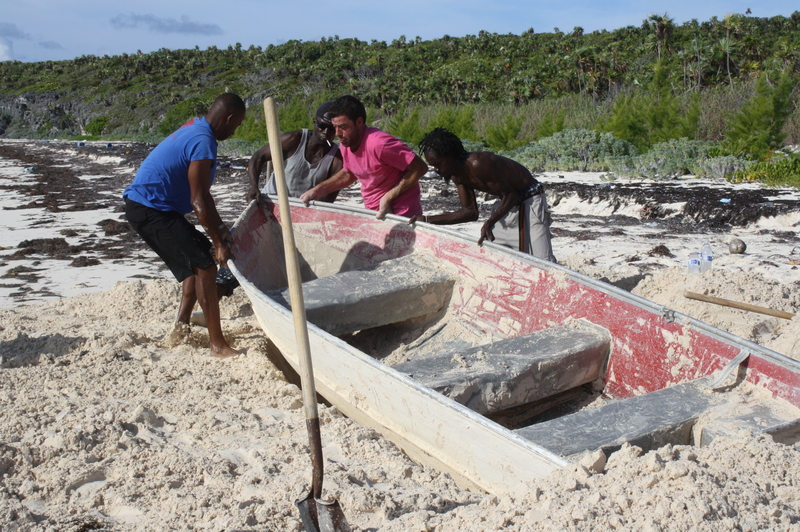 A few month ago Tommy somehow found out that a guy from the Island had “borrowed” the boat without asking and then abandoned it somewhere ……. 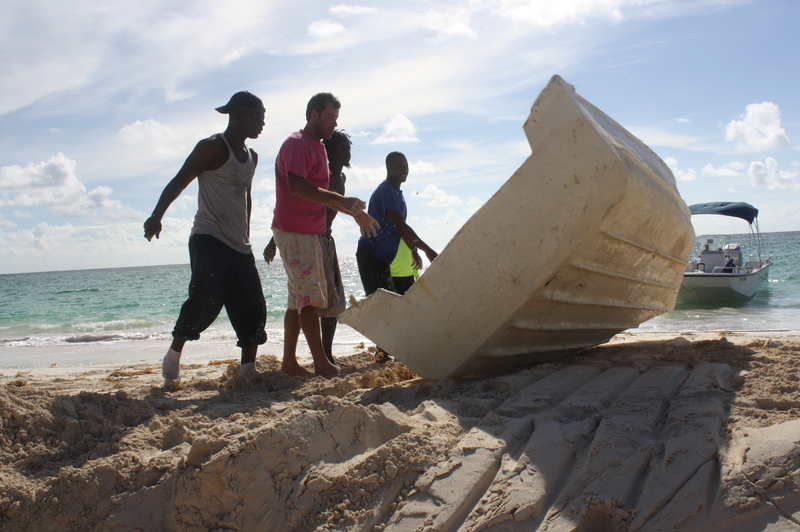 Just recently and by accident a friend of Tommy’s found the boat on Treasure beach , FULL of sand and imbedded into the beautiful beach. 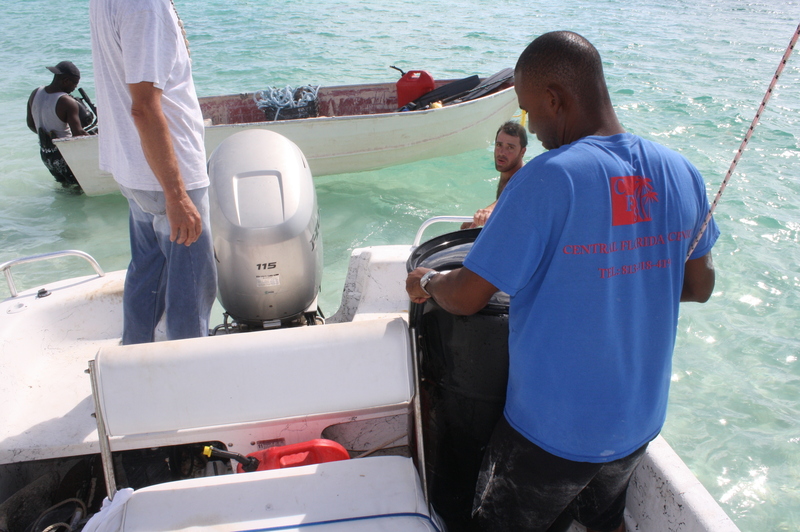 So, today was the day, off we went to resume the boat. Two cars, seven people and six shuffles, beer and egg salad and home-made bread. 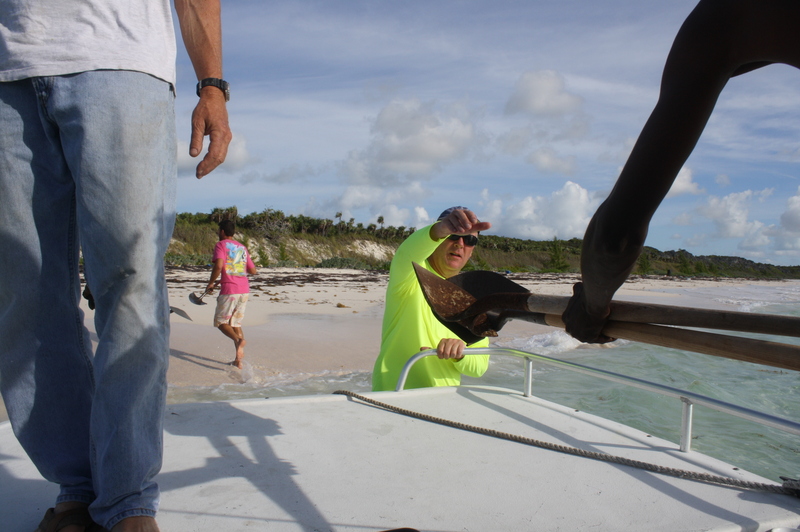 The pictures will tell the rest of the story from our boat rescue operation on San Salvador In the Bahamas. 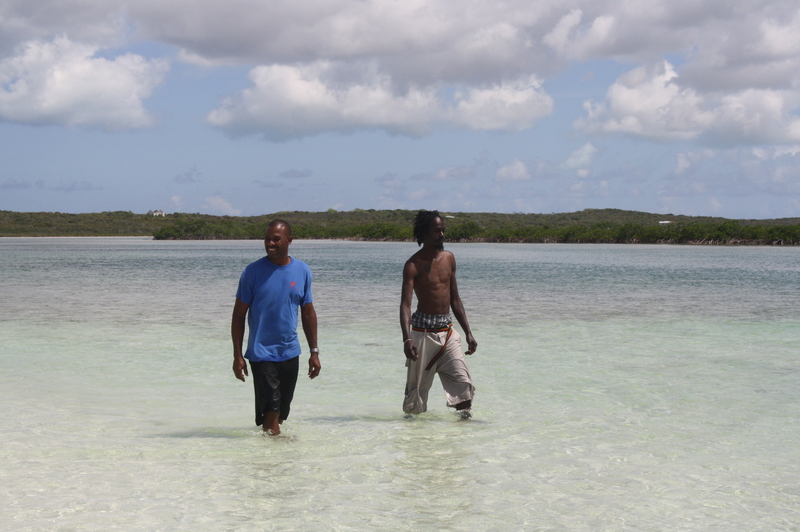 T&T (Tommy and Tony) arriving at Brian’s boat dock in Pigeon Creek on San Salvador’s east coast. 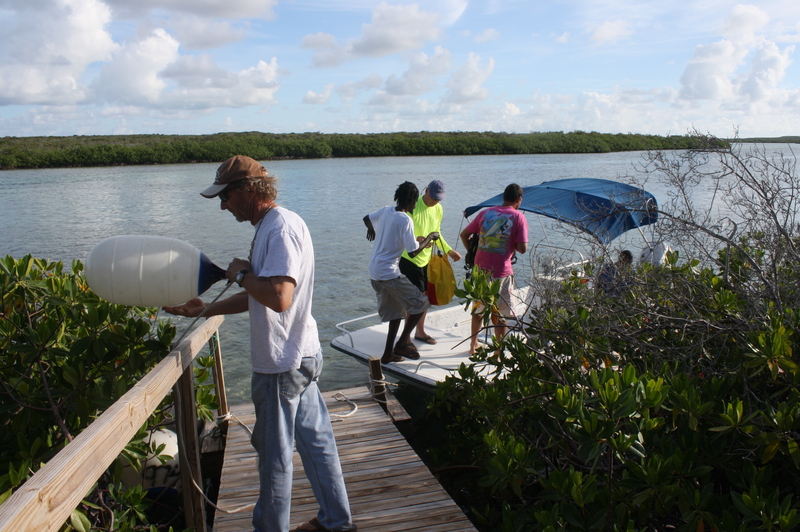 Loading up the Boat in Pigeon creek and getting ready for our San Salvador boat rescue mission. After a beautiful boat ride we arrived and Brian is pointing out the boat. Yes, I do understand if you can’t see it, it is this tiny little sliver of red sticking out of the beach by a few inches. To this day I have no idea how Brian spotted it. Treasure beach in San Salvador is a very special place, you can find all kinds of things from all over the world that somehow make their way onshore. 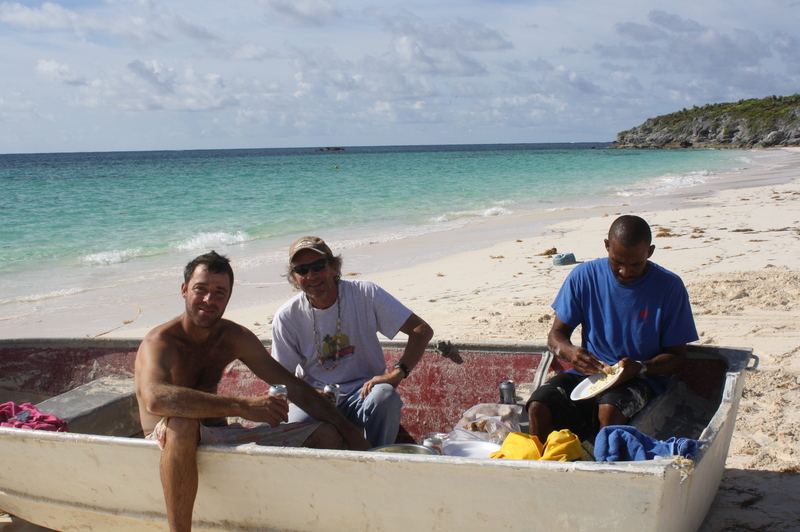 Boat is beached and we are unloading the shuffles and some refreshing drinks like water and maybe some beer…… Everybody is in high spirits, ready to rescue Tommy’s boat and bring it back to the west coast of San Salvador for much needed maintenance. And the digging begins ! Didn’t really go as fast as we hoped. Can you see it, we are making progress ! Well maybe I should not say “we”, I was taking the photos and the guys were doing all the hard work. San Salvador is a special place, if you get in trouble you will always find people to help you out. 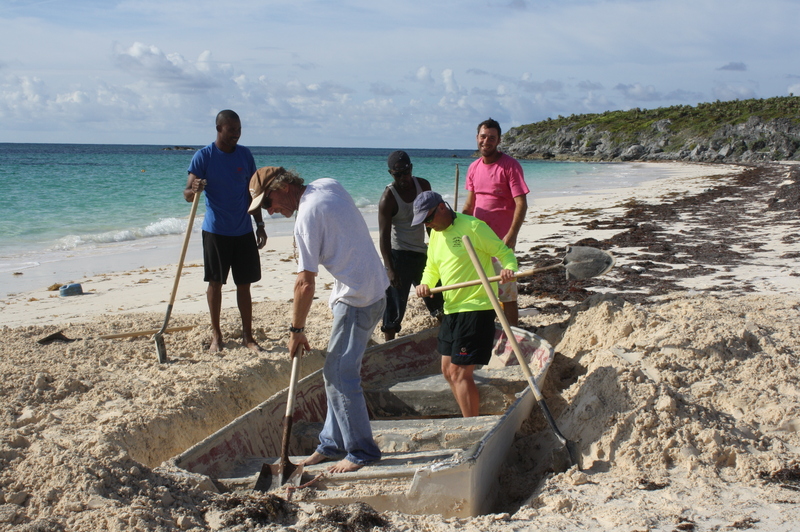 Even if it involves digging out a boat in 86 degrees temperature. How awesome, the boat is nearly empty. 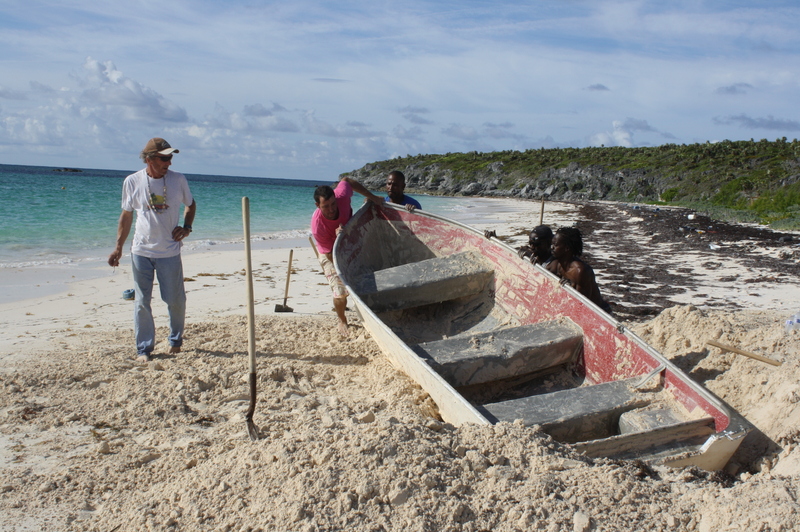 First try to get it out but this boat was still so heavy. Yes, everybody is feeling good, boat is moving. Some more digging but we are nearly done. 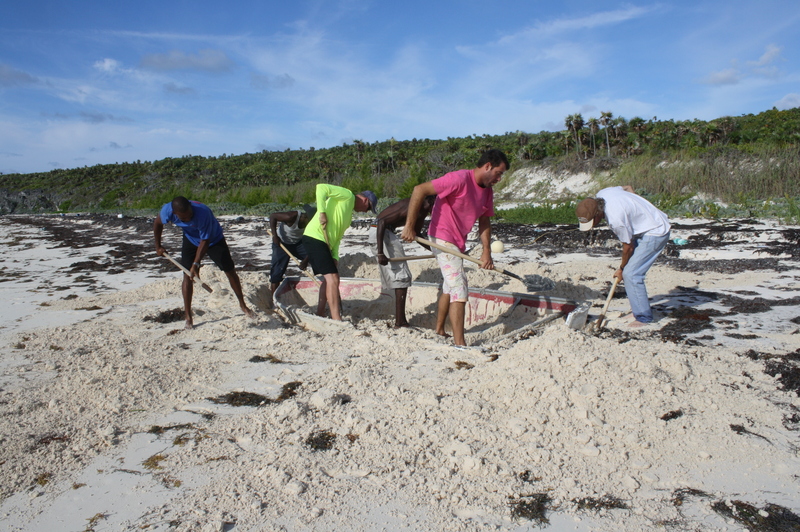 Boat is out, the guys flipped it a few times to get the last bit of sand out. 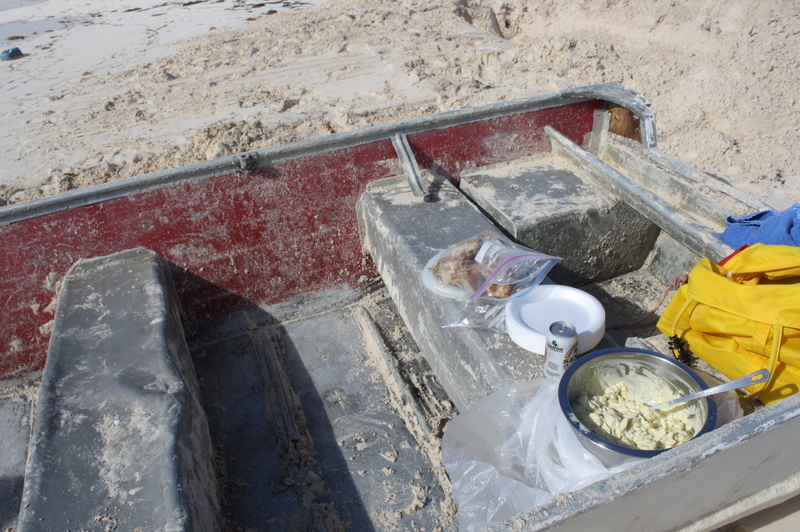 Breakfast is served, San Salvador style in the rescued boat. Happy Tommy (on the left) he has his boat back and was fed, what more can you ask for on a Saturday morning in San Salvador? 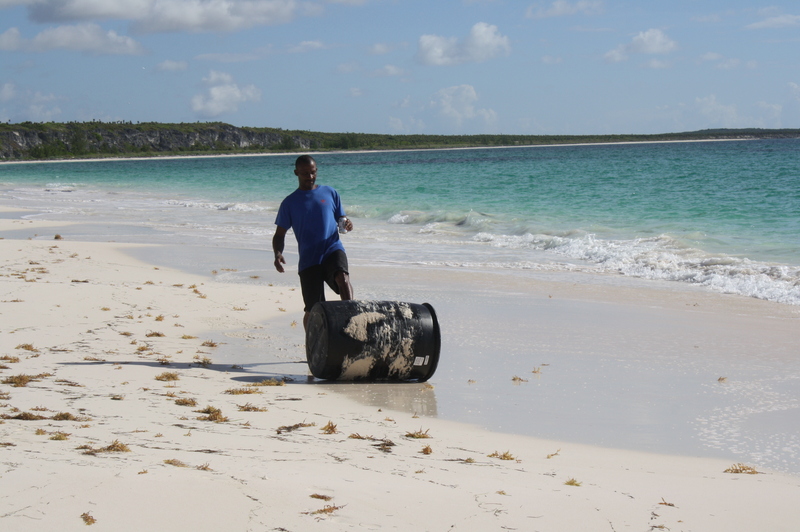 Before launching the boat in the water we all took a well deserved break, This is Andre, he found a brand new drum while walking on the beach and he was determined to bring it home. 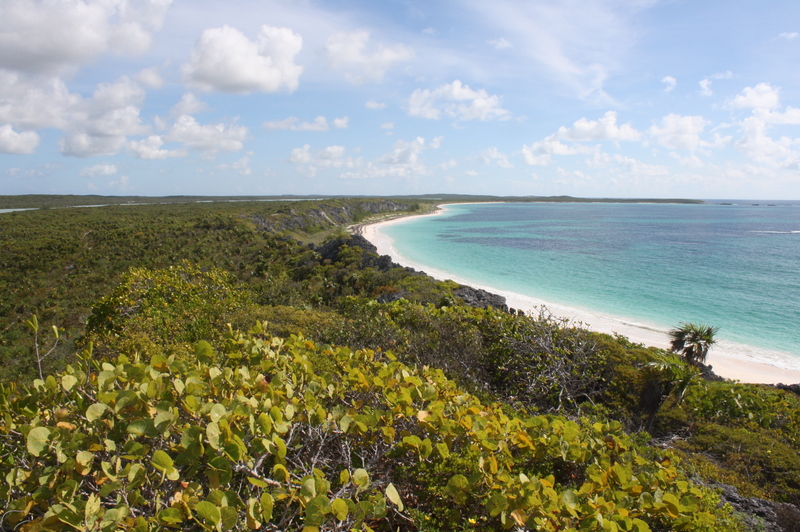 Stefan and Brian took a walk up the hill to one of San Salvador’s Lookout towers and took this beautiful picture of Treasure Beach. Getting ready to leave, bringing everything back. 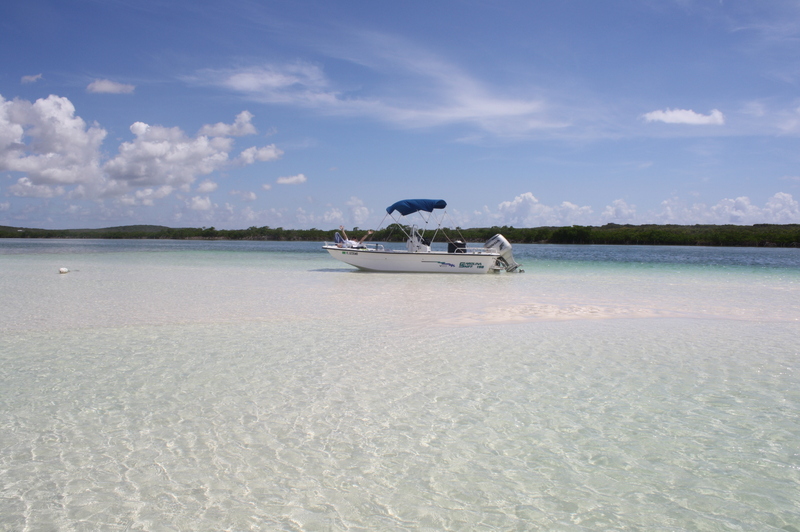 On our way back we took the time to admire Pigeon creek and the crystal clear waters of San Salvador here in the Bahamas. 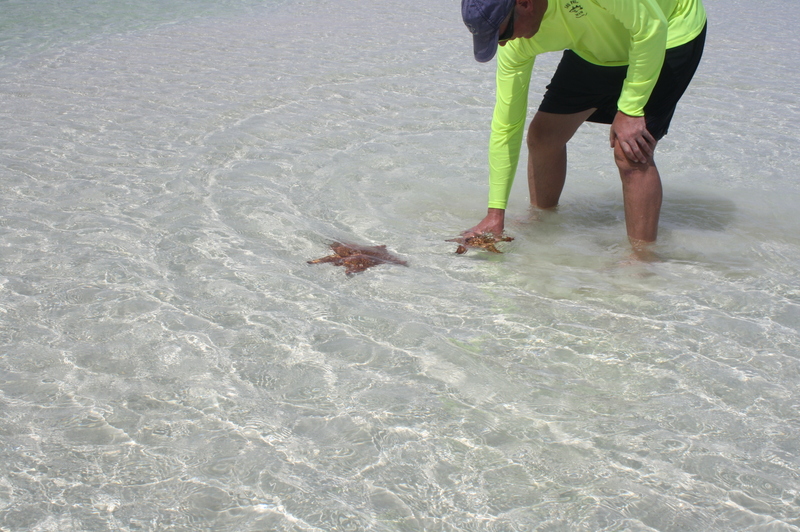 Here is Brian, playing with some star fish. 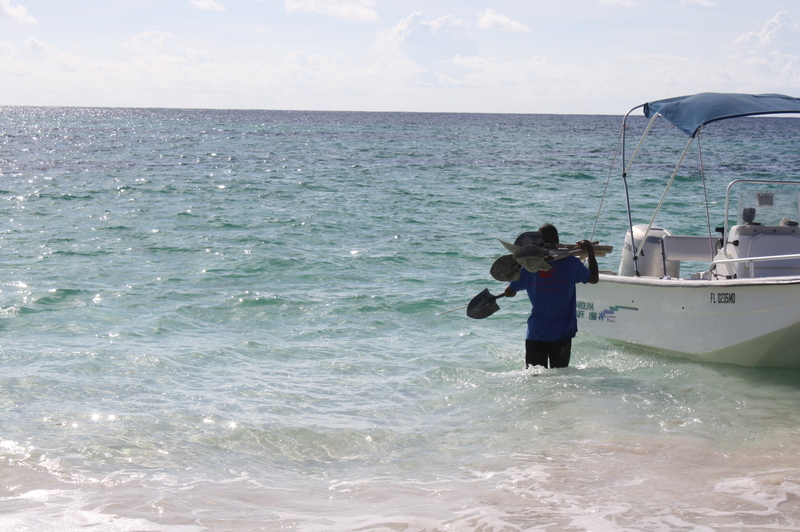 Time to leave, guys are walking back to the boat. with a bunch of friends. When I left Florida mid February my friends were taking bats on how long it would take till I get totally bored and rush back to Fl. Most of them thought it would be two month and only a few had three month, nobody gave me more than that. 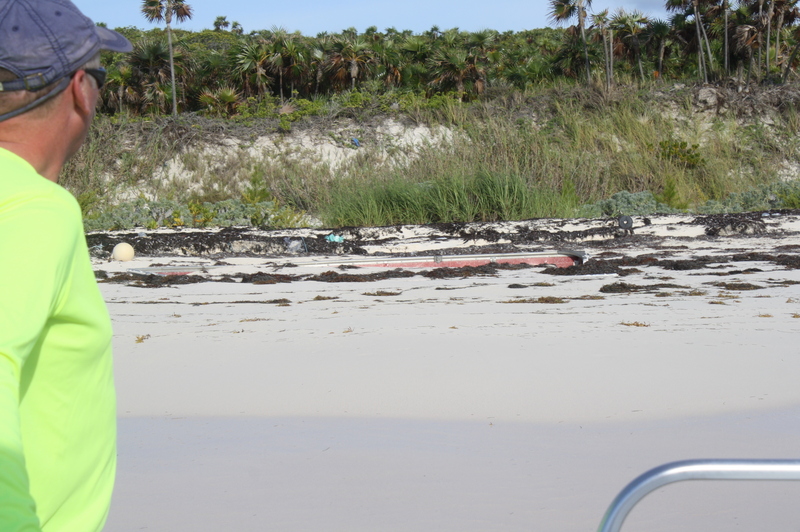 By now it is beginning of June and I am still not bored….. And this was one of the stories that keeps things interesting here on San Salvador in the Bahamas. 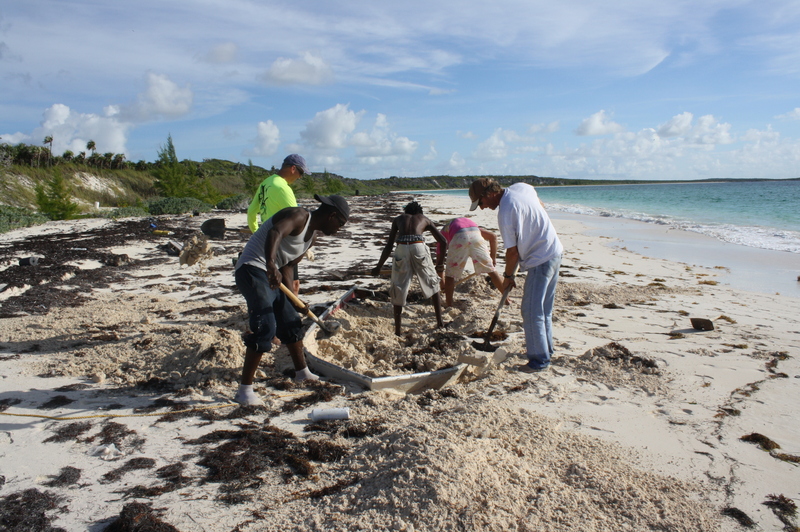 Thank you for commenting on my blog about San Salvador here in the Bahamas. 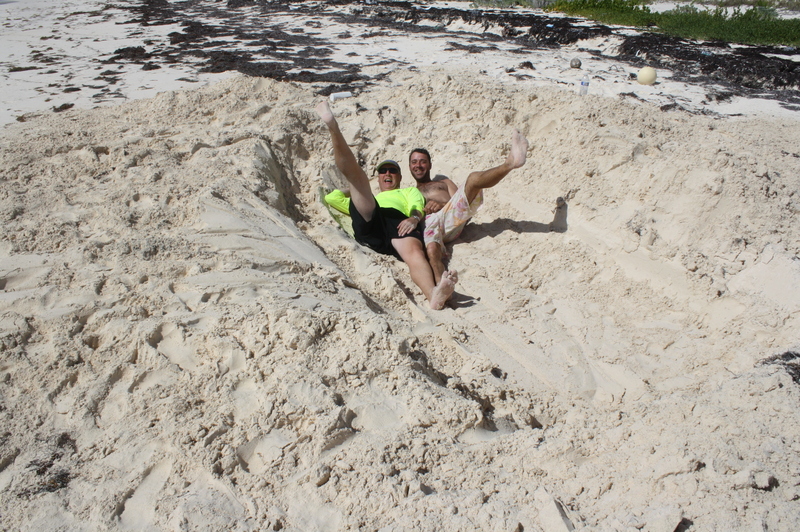 As you said, it is an incredible little Island and has a lot of beautiful diving spots. I sorry you wont be coming back to the Island but maybe my little stories (hopefully many more to come) about the island will be enjoyable to you.